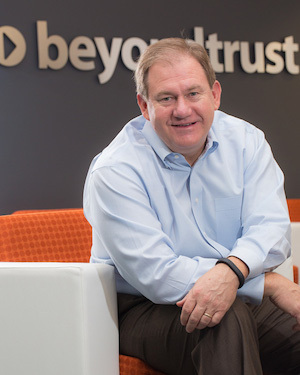 For Kevin Hickey, the importance and necessity of what his company, BeyondTrust, does is nothing new—he’s been a part of the software and security industry since the early eighties. Further, he knows how breaches happen and how much more likely they are to happen these days. What is new is how many other businesses now understand this, too. “Customers are saying, ‘Look, we know we have vulnerabilities; we know we’re going to be breached … help us try to keep them out and minimize the damage if they do get in,’” Hickey says. As it happens, BeyondTrust is all about handling both requests. The company is able to continuously monitor physical, virtual, mobile, and cloud environments—and then layer in privileged account management (PAM) to reduce internal threats, plus vulnerability management to mitigate external threats. Breaches, privileges, compliance—terms like these are now part of the mainstream as businesses go about determining not if they need protection, but how much protection they need. Information, as well as the intelligence to use it properly, is at a premium, and Hickey feels BeyondTrust is superior at handling privilege and vulnerability management in a very practical manner. “What we’re doing that is very unique is taking both internal and external risk information, and supplying it to companies to help them make better decisions about their security environments,” he says, adding that it would essentially take six different security companies to cover all the services offered by BeyondTrust. The idea is for BeyondTrust’s products to provide everyone in a given environment—administrators included—with the same minimized rights, while escalating the rights to the application side. In doing so, intelligence is given to chief security officers, boards, and tech administrators, and a safer environment prevails.